Aleksi Briclot is a Paris-based concept artist and art director for the gaming industry as well as an illustrator and comics artist. His game credits include lead artist on ColdFear, a horror themed action game from DarkWorks and Ubisoft, Splinter Cell Double Agent and the new titles Haze from Ubisoft and Dungeon Runners from NCSoft. He has done numerous illustrations for RPG books, magazines and comics, including covers for Mage, C.O.P.S. 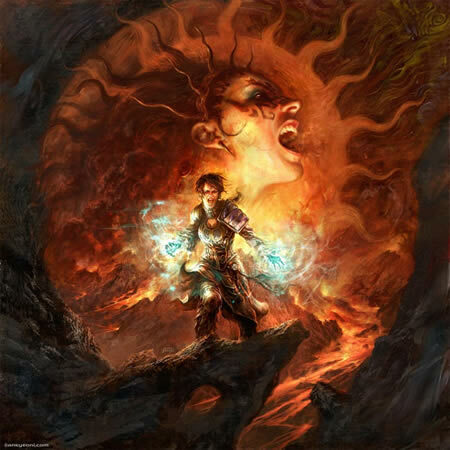 Rpgs, Privateer Press, and World of Warcraft, as well as an extensive series of paintings for the Wizards of the Coast card series Magic: the Gathering, Dreamblade. His comics industry work includes the videogame adaptation Alone in the Dark 4, Spawn: Simony and the new Spawn graphic album Architects of Fear, as well as covers for Marvel’s Annihilation: Conquest series and the Hellgate limited series from Dark Horse. His comics interiors are in the fully painted approach rather than the traditional line and color method. Briclot is also an instructor for the international ConceptArt/Massive Black workshops, and his work has been featured in several anthologies of digital and fantastic art, including being chosen for the back cover of the recent Spectrum 14. Briclot is obviously a busy fellow and his web site hasn’t been updated for a long time. Though the home page is hung with apologetic notes that might give you the idea it’s closed until renovations can happen, it is in fact open and you can view his gallery of earlier work. He is for the moment throwing more recent work up on his informal MySpace page. I’ve also found a few other resources and listed them for you below. Briclot often works his fantasy and horror-themed compositions in swirls of form and suggested movement, at times almost in concentric rings. His flaming demons and maniacally grimacing monsters spin out at you, with their intense colors pushing them forward from muted low-chroma backgrounds, or brightly surge from haunted layers of darkness. He also does terrific dragons, writhing and twisting, turning their spiky heads in imminent threat displays. His work for C.O.P.S. displays a science fiction edge that stands out a bit from his other work and would be interesting to see more of. All of his work utilizes texture to both give grit and substance to the images and to tie them together as a visual whole. Briclot is also involved in a European artbook called Merlin in collaboration with artist Jean-Sebastien Rossbach (and possibly others, I’m not certain). The project is represented on MySpace as if it were Merlin’s own MySpace page. I FORGOT TO MENTION THAT I AM TRYING TO LEARN HOW TO USE THE CS3 PHOTOSHOP ON MY COMPUTER AND ARTISTS LIKE YOU HELP ME WITH MY COLOR SELECTION, THE USE OF LIGHT & DARK AS WELL AS CONTENT. THANK YOU FOR BEING SO GOOD. YOUR TALENTS ARE APPRECIATED…THANKS AGAIN.